The crafting system will soon be upon us, get your premium sets ready! * It wasn’t posted in the update site, but there seems to be some confusion over whether the new city quest we’re getting is an Emergency or Limited Quest. The new city quest is an Emergency Quest that will have its schedule announced ahead of time. This quest is similar to Chaotic Border Break except that it has boosted enemies all around. 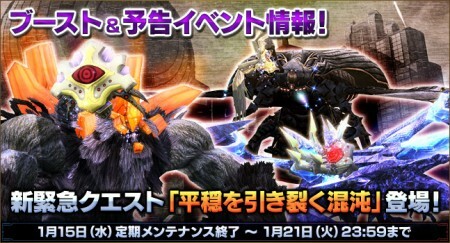 Afterwards there will be a 1 year anniversary event to commemorate the Vita release of PSO2. This event is known as the “ARKS United Front 2014” (name subject to change based on the url) and is scheduled to begin January 22nd through March 5th. 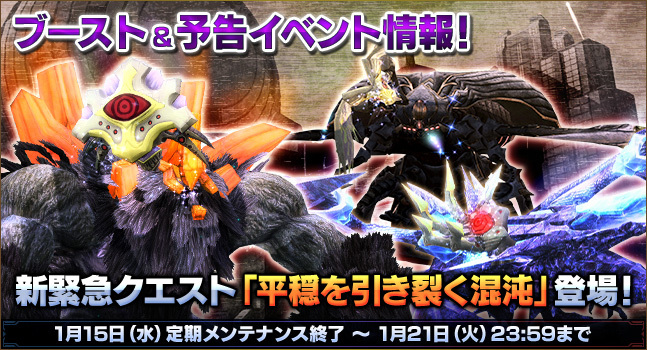 The event will include its own limited quest in similar vein to Chaotic Border Break but takes place on the Beach. Affects New OTP Registrations and OTP Secret Question/Answer changes. Token authorizations are not affected. You will not be able to purchase Arks Cash with Webmoney during that time. An Interrupt Ranking for Marathon Practice Naberius (SH) Time Attack is scheduled on January 21st at 21:00 JST. A +100% EXP boost and 10x Meseta Clear Rewards will apply to that quest on all difficulties. 「Advance Quest」+200％ EXP and Rare Drop Boost. 「F. Continent Exploration」＋100％ EXP and +50% Rare Drop Boost. This week is Kressida’s turn in handling the Client Order Campaign.